That got me excited so I searched their site to see how it's done. a text message from them and you just have to confirm by replying with your pin. 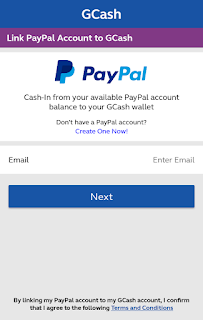 It took me a while to be able to link my PayPal to GCash since I've encountered some problem. I'm a registered GCash user. I've been KYC'd since I can't remember when. 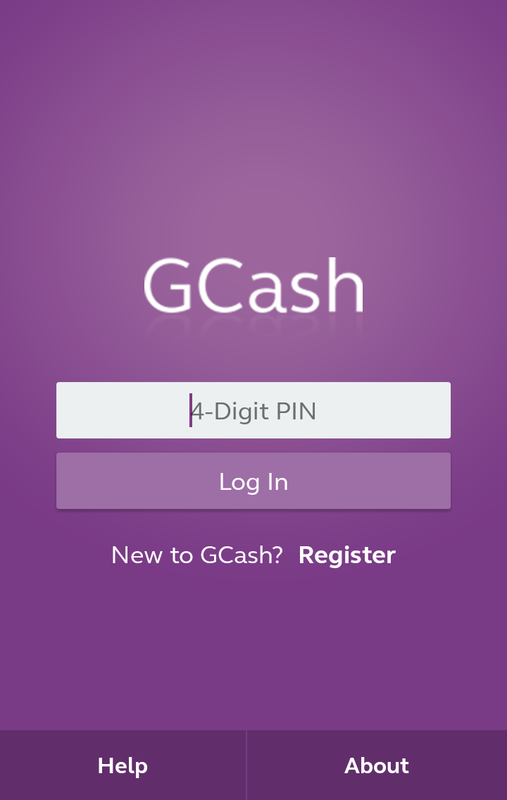 I've installed the GCash app already for my Prepaid load purposes. 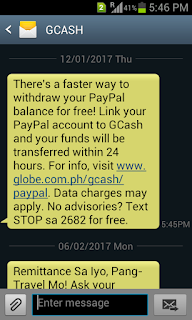 I bought the GCash Mastercard this January when I received that message and linked it to my GCash account. So I thought I'm already well equipped for this. I logged in to my GCash account. Selected the "Link PayPal Account". Entered my PayPal email address and clicked "Next". I entered my PayPal email address again on the next page plus my password. So I thought I was done linking my account. I clicked the "Close and Continue" but nothing happened. I waited for several minutes but it's not redirecting me to anywhere. I checked my email and I received an email confirmation from PayPal. 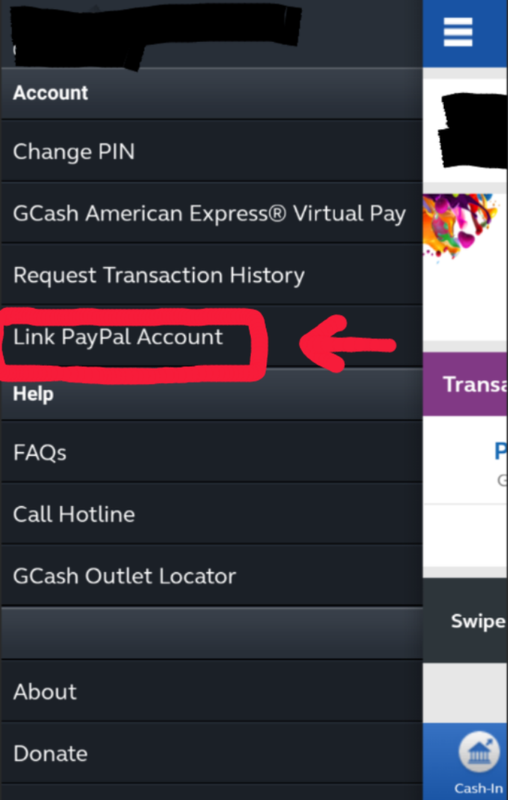 However, when I tried to Cash in, the "PayPal to GCash" option is still not clickable. When I tried to select it, a message appears telling me that I still have to link my PayPal account. 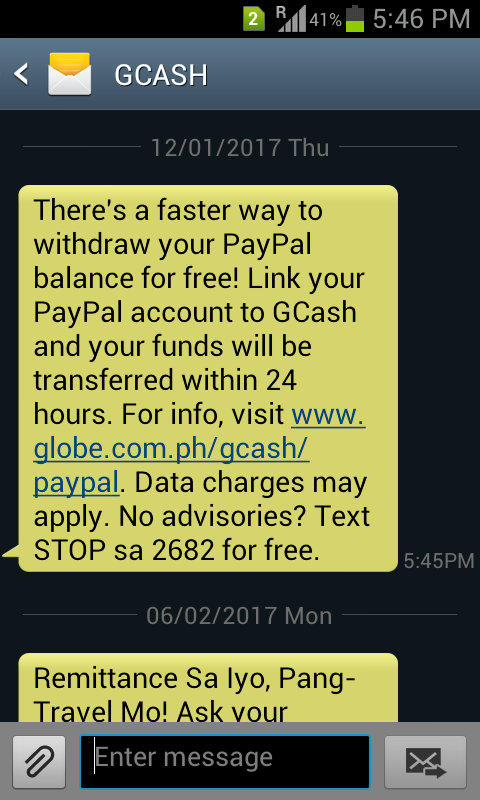 I tried to cancel my first pre-approved plan between GCash and PayPal as suggested by a GCash staff that I chatted to on their Facebook. And then tried to re-link it again. But still, the same issue persisted. I told them what happened, and waited for their reply, but I received none. I chatted them the following week for an update of my query then they asked me for my PayPal address, GCash registered mobile number, my mobile device brand and OS version. I gave what they asked and they said they will forward it to their technical team. When they got back to me, they said my concern has been resolved and that I should re-link again my PayPal to my GCash account. I did what I was told, but still, nothing has changed. I still get stuck to that "Thank you for linking your account" message and the "PayPal to GCash" Cash in option is still not clickable. Again, they said they will forward this to their technical team to be checked. But they replied with the same solution again the next day, telling me that it's already fixed and that I have to re-link my accounts again. So for the nth time, I cancelled my pre-approved plan and re-linked it, but the usual scenario appeared. For the last time, I told them that nothing has improved, I still get stuck on that "Thank you for linking your.." blah blah message. And I asked them if there's anything that I still have to do on my part aside from cancelling and re-linking my account. They said they'll re-forward this again to their technical team, but I received no response from them again. I tried to read some comments about this "PayPal to GCash" thing on their Facebook page and I saw a comment that has the same problem as mine. Another one replied to that comment saying that he experienced that too when he first tried it on an Android Kitkat OS. But when he tried linking it with a newer Android version, it worked. Fortunately, Lazada has a Valentines sale this February, so I ordered a new phone with an Android 6.0 Marshmallow OS last February 10 which was delivered to me on the 14th. Finally, when I transferred my sim card there, installed the app and tried to link my PayPal, it worked on my first try! That message of "Thank you for linking..." appeared again, but when I clicked the "Close and Continue", it finally redirected me to a page saying that my account has been linked. 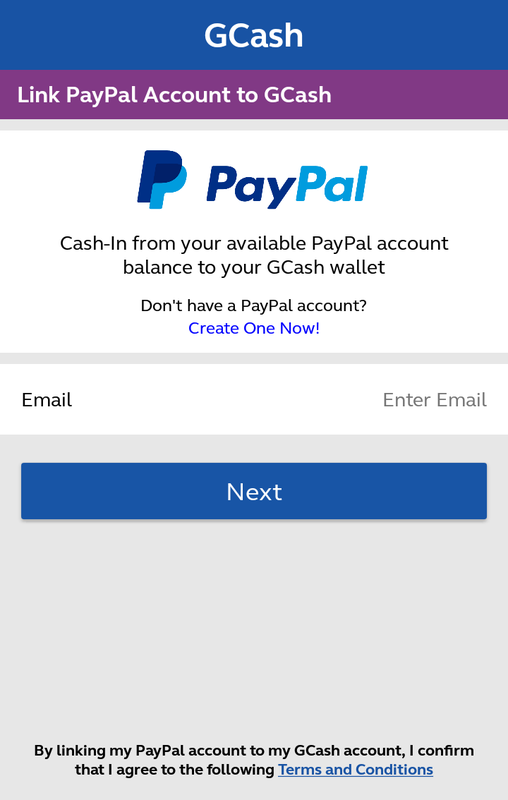 And when I checked my Cash In tab, the "PayPal to Gcash" option is now available. Yey! By the way, my old phone's model is Samsung S Duos with an Android 4.0.4 OS (Ice Cream Sandwich, I guess?) that was bought in 2013 so I guess it's also time for me to buy a new one. And I'm quite happy with this SKK mobile that I bought for a cheap price. If the above experience still does not resolve yours, I have seen a comment left by Iann Games on Google Play store which might help you instead. "Sa mga namomroblema dyan about Cash-in from PayPal to GCash, just follow these steps. 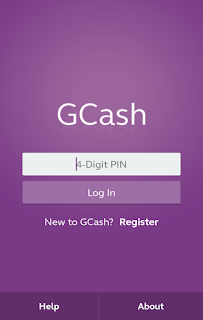 If you are unable to cash in at this time, please cancel all the active preapproved payments in you account to GCash and kindly follow the work around below in linking it again. Go to your Device Settings > Apps > Show System Apps > Look for Android System WebView and disable that. Then, go back to your GCash app account and follow the linking process. Make sure you reach the confirmation page to ensure successful linking. Once the account is linked, you can withdraw your money immediately. It should work this time." 1. Uhm, are you KYC'd already? If yes, hmmm, maybe you can try linking it using your other phone if any with either Lollipop or Marshmallow OS [since these are the OS that I saw working when linking PayPal to GCash]. I know yours is newer than those two, but I'm not sure if GCash' latest app version has already been updated for that [when it comes to linking PayPal to GCash]. 2. Or maybe you can also try posting your comment in one of GCash' Facebook posts together with the screenshot of the last page you are stuck in to, and we can have a reply from other users who've experienced it too with Android 7. 3. Try messaging GCash about your problem [although I've done this before too and they weren't able to solve it], just inform them about issue. I hope your problem gets solved. I'm having the same problem! KYC already. Gcaah on PayPal pre-approved payment plan list. Im using Marshmallow 6. Been to Globe store 5x already but even the staff coefox the problem. Cash stuck in PayPal for more than a month already. I feel you~! In the end, Globe staff was not able to fix my problem as well and I just searched on my own by reading in their Facebook page to look for comments who had the same problem as mine and what they did to fix it. I'm not sure about your case though since we are using the same OS version (Marshmallow). That should have fixed it if your problem is getting stuck with the "Thank you for linking your account" message in your GCash app. Even when clicking the "Close & Continue" button, still nothing happens? You can try to maybe use another phone (if you have a spare) and try re-linking your PayPal to GCash with that. 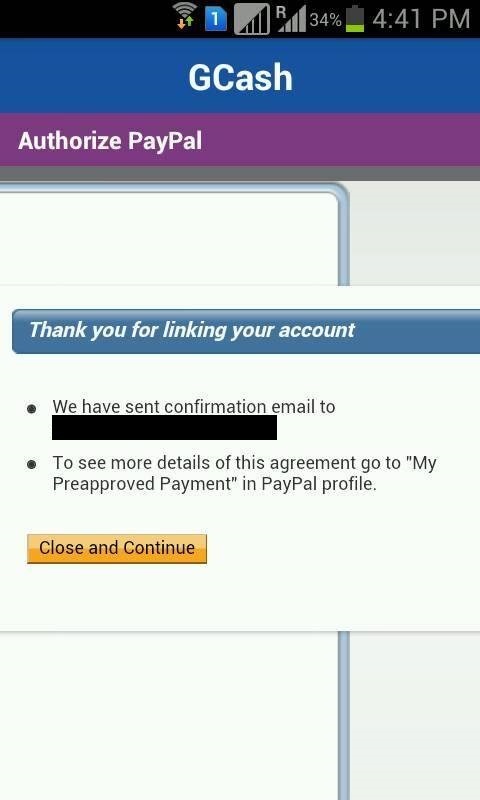 Don't forget to first unlink your pre-approved plan in your PayPal account before doing so. 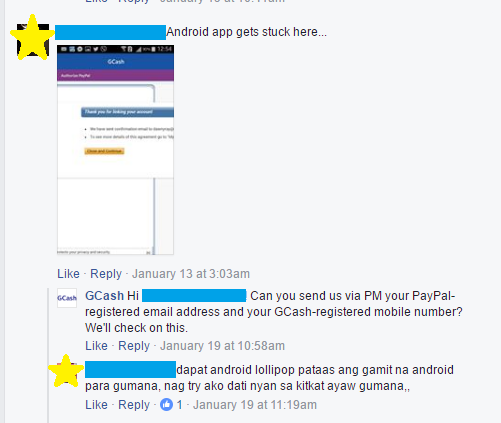 If still that doesn't work, sharing your problem in GCash' Facebook post (specifically Paypal-related) can reach out to other users who had encountered the same problem and share some solution tips there. A screenshot of your problem will get your comment more noticeable by other users as well, especially those who relate to it. I hope this helps and that your problem gets fixed soon. I wish you could share here too what fixed your problem in the future. I know it's too late for this reply. But I'm replying for the future GCash Customers who might also face the same problem. I am using an android 6.0 too. And what I did to solve this problem is update an android system app named "Android System WebView". Open your Google Play and search for Android System WebView, install/update the app. After that, try linking your GCash to your PayPal again. Hope it works for you.